Perform quick, secure and reliable backup of your emails; restore individual emails or mailboxes; schedule a backup for a later time. IDrive's Exchange Brick-Level Mailbox Backup allows you to backup/restore individual mailboxes on the MS Exchange Server Store to your IDrive account. The application backs up the contents of the selected mailbox (es) or an individual email to the Personal Folder (.PST) file. The emails from the Personal Folder (.PST) file can be restored to your MS Exchange Server Mailbox, using the IDrive Exchange Brick-Level Mailbox restore feature. 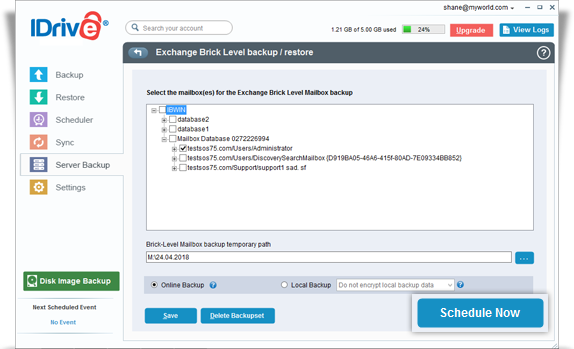 'Exchange Brick-Level Mailbox Backup' is designed only to backup/restore individual mailboxes for the selected mailbox stores and is not a method for the complete backup or recovery of the Exchange database. 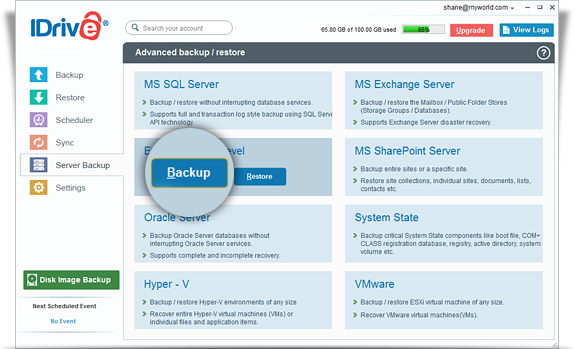 For a complete Exchange database backup to ensure Exchange recovery, use the 'Exchange Server backup/restore' feature. Note: Ensure that appropriate Mailbox Rights are granted to perform the 'Exchange Brick-Level Mailbox Backup' for selected mailbox or mailboxes. Online backup of individual Mailboxes for the selected Mailbox stores without interrupting the running MS Exchange Server services. Backups can be scheduled for a future day and time with various scheduling options. 256-bit AES encryption on transfer and storage with a user-defined key that is not stored anywhere on IDrive servers. Select the mailbox database(s) from the list displayed, specify the temporary local backup path and click the 'Schedule Now' button. 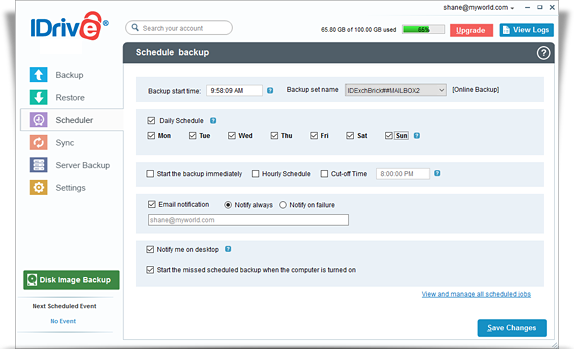 The ‘Schedule backup’ screen is displayed where you can schedule the backup for any future day and time or perform an immediate backup of the selected mailbox databases.